JibJab is known for their customizable funny videos. And they bring out special videos for Christmas season. JibJab lets you create fun videos customized with your own faces from pictures you upload. You can then share that video with your friends and family taking the greeting card to the next level. 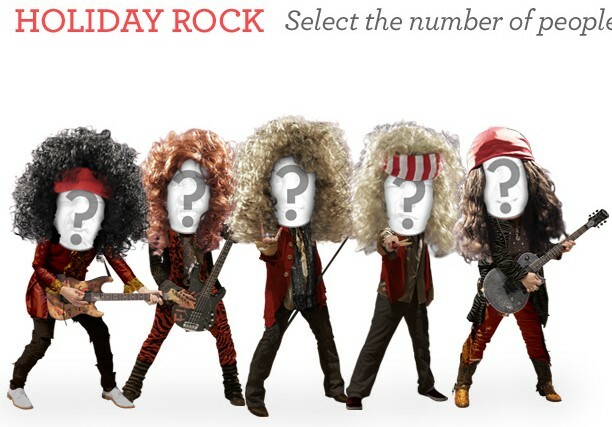 Holiday Rock is the funny Christmas video of the year from Jib jab. Just choose the number of people you want in the video and upload their photos. JibJab does the rest and gives you a rocking funny video you can send to your friends and family for a great laugh. Holiday Rock, Christmas funny video, is free. Also, there is another free video you could make this holiday season. Holiday Disco. Again you can select upto 5 people for this video and you can laugh your heart out. JibJab has launched 2009 version of ElfYourself which started by itself back in 2006. When they started out the elves just had a fairly simply dance routine in a green outfit. ElfYourself team joined with JibJab to power ElfYourself in 2008 and doing this second year in a row. Last year, though users were required to register with JibJab before they could send the video. However, this year ElfYourself 2009 does not have the registration requirement. Instead, they use Facebook Connect to offer 1-click signon. The best part is this helping JibJab vides spread virally through Facebook status updates. You can now create ElfYourself videos here and share them for free! Hey, on the other side of the pond, even Prince Harry has created a Royal ElfYourself video and sent it as his Christmas greeting this year. If you would like to take a look at the real Elf dancers behind the scenes, you can do that too. Enjoy creating your ElfYourself video and make a few people laugh this season.